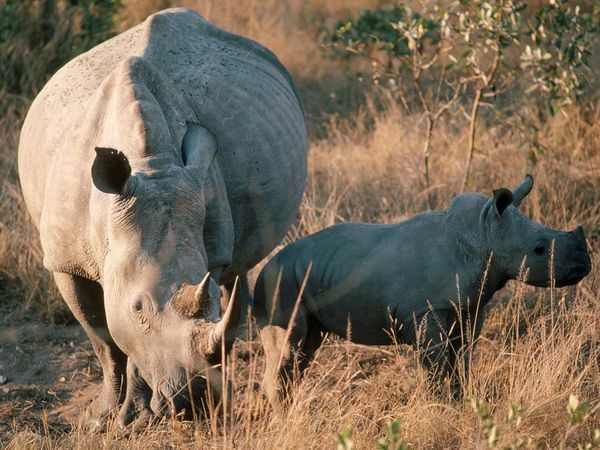 Rhinos are one of the oldest species of mammals on the planet. Brought back in from the brink of extinction in southern Africa, they are once again under grave threat. As a very strong article in The Guardian details, one of the world’s greatest preserves for rhinos, the Hluhluwe-Imfolozi park in South Africa’s KwaZulu-Natal province, is threatened by plans to permit the opening of an open-cast coal mine near the border of the park. The mines would draw large numbers of people to the area, many of whom would inevitably be enticed by the high prices of rhino horns on the international black market. The question of what South Africa is doing opening so many coal mines is the gaping question that underlies current developments. The article in The Guardian mentions that the number of operating mines in South Africa has increased from 993 in 2004 to 1,579 in 2012. The government argues, the article suggests, that these mines are necessary to provide power to the country’s majority population, against whom apartheid policies discriminated in many ways, including energy provision. But why is coal power, the most dirty form of fossil fuel, the dominant mode of energy generation in South Africa? To a certain extent, this seems like a misguided policy on the part of a national government – the ANC – desperate to provide resources to its people under constrained conditions. But such an analysis ignores the significant boost that coal has gotten from international interests, including the World Bank. As Patrick Bond details in an account of the grievously misguided loan from the World Bank for the building of the coal-powered Medupi power station in northern South Africa, international lenders such as the World Bank have a long record of supporting the most purblind and environmentally destructive development policies in South Africa. Among the many destructive impacts of such policies, then, we might think about how the support for coal mining contributes not just to climate change on a global plane, but also to the potential extinction of one of South Africa’s greatest natural treasures: the white rhino.